I finally made it out to one of the Beard Papa’s locations in San Francisco. For those of you not familiar with Beard Papa’s, it’s a series of stores based out Japan that specializes in all natural cream puffs, the kind that comes fresh out of the oven. Known as the bakery of the “World’s Best Cream Puffs”, Beard Papaâ€™s has been a household name since 1999 when Yuji Hirota opened the first Beard Papaâ€™s store in Osaka, Japan pumping out this unique cream puff to happy people. 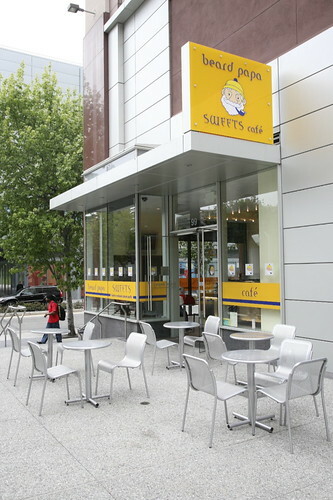 Since that time, our mission has remained unchanged, to pursue uncompromising quality in serving the Worldâ€™s Best Cream Puffs. 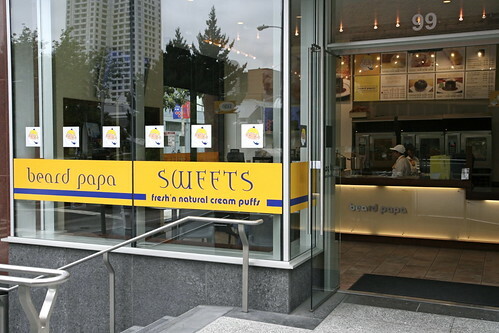 By remaining focused in our quality commitment and attention to customer service, Beard Papaâ€™s has courted a devout following of puff lovers who will attest that once you taste our cream puffs, there is no comparison. 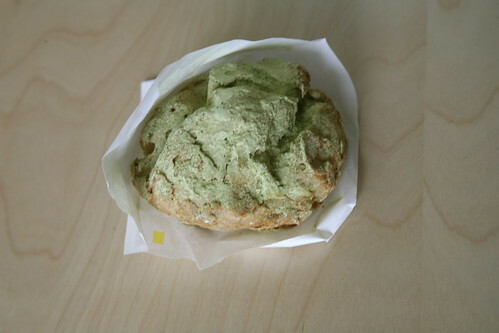 My choice for my first visit was the curious green tea cream puff.